About Rats: The rats in Pennsylvania are Roof Rats (rattus rattus). They commonly enter homes and attics, and can be heard at night scampering across the ceiling or up and down the walls. They are common disease vectors, and as rodents, they pose a threat with their chewing. Chewing on electrical wires can create a fire hazard. The only way to solve a rat problem is by finding and sealing all points of entry shut. Never use poison for rat control! Only creates a bigger problem! 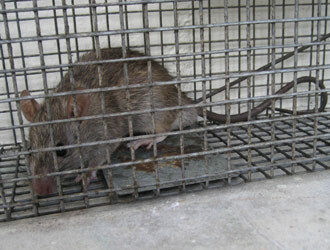 Rats and mice are common nuisance rodents in southeast Pennsylvania. In Philadelphia and Montgomery County, rats have become a particularly common problem, as they have invaded many homes in the area. MY RESPONSE: That's a tough case. You can't stop them from going inside a truck. Maybe park inside a garage? Other than that, I guess I'd set trapping stations around the truck - basically, a rat trap inside a box.